‘Alas, poor Yorick! I knew him, Horatio’; ‘Friends, Romans and countrymen, lend me your ears’; ‘To be or not to be, that is the question’; and ‘Shall I compare thee to a summer’s day?’ are all familiar excerpts of Shakespearean prose but ‘Brother junior warden, your place in the lodge?’; ‘I rise for the first time to enquire’; and ‘Brethren, assist me to open the lodge’, are not so well documented Shakespearean quotations. Frank Umbers (left) congratulating the new master Michael Shakespeare. That is about to change however now that Michael Shakespeare has been installed into the chair of King Solomon in North Shore Lodge No 7916 during a ceremony that even the most scathing of theatre critics could not have faulted. The performance delivered drama, comedy and empathy, with a touch of musical comedy to lighten the mood still further. But thankfully, Shakespeare’s love of tragedy and pathos did not surface to tarnish the event. It was a purely joyous occasion. A Masonic lodge room at installation time can be a magical place. When performers produce excellence in ritual and an audience is appreciative of the hard work that has gone into the presentation, it makes for an immediacy that can only be paralleled by high quality theatre. The North Shore Lodge installation team provided its audience with a show of distinction and received approbations worthy of the close of one of Shakespeare’s finest productions at the Globe Theatre. From the moment the curtain went up it was evident that there was to be a show of rare quality. 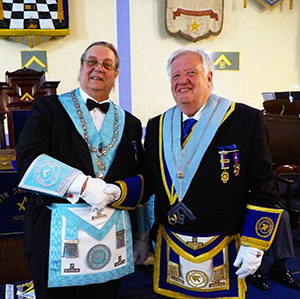 Principal protagonist in the production was installing master Ramon Ashton, who opened the proceedings and conducted the general business of the lodge with exactitude and flair and continued in exemplary fashion throughout the whole ceremony. One must add however that the audience was equally talented. Making his debut as Assistant Provincial Grand Master at an installation was Francis Anthony Umbers, principal guest for the evening. ‘Frank’ enjoyed an accompanying cast of fellow grand officers including Past Assistant Provincial Grand Master Harry Cox, Ron Sands, Peter Bentham, John Turpin and David Thomas, along with acting Provincial grand officers John Pitches, John Riley and Graham Kenyon. A superb performance and a highly appreciative audience made for a great night. Once the distinguished notables had been decanted into their allotted seats and Frank Umbers had graciously declined the gavel of the lodge, the installation proper commenced. Michael Tax, Ormerod Green and Emmanuel Adeoye were duly placed in their respective offices of installing senior warden, installing junior warden and installing inner guard prior to Len Jolley temporarily relinquishing his post at the organ to present Michael Shakespeare to Ramon Ashton in readiness for his installation. In truly Thespian fashion, Michael recited his obligation in masterly fashion, projecting his voice like a seasoned pro. It was powerful, crisp and dramatic. 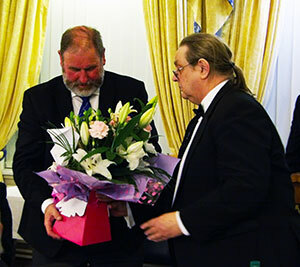 Michael Shakespeare (left) receives the congratulations of Ramon Ashton. Class performances continued as Ramon conducted the installation ceremony. He was precise yet charming. He was relaxed yet preserved an appropriate reverence. He was meticulous yet entertaining. Michael, on his part, invested Ramon as immediate past master with the same confidence and panache that he had displayed in executing his obligation. The delights of the ceremony were many and varied. It was particularly pleasing to see that as many members of the lodge as possible had an involvement in the proceedings. There was no repetition of performers. Each had been allocated his piece of ritual and each had ensured the highest standard of delivery. Coordinating and gelling such a diverse cast is no easy task and requires a director of ceremonies of no mean talent. Fortunately, North Shore Lodge possesses a director of ceremonies with impeccable credentials and the necessary organisational skills. Proving his worth as a ritualist, Ron Strangwick delivered a classic address to the immediate past master, a piece not frequently carried out at installations. Similarly, stalwart of the lodge Gordon Thomson delighted the proletariat with a superb explanation of the working tools of an installed master. The magnificent quality of ritual remained for the duration of the ceremony. ‘Light blue’ brethren demonstrated that they were not going to let the side down. Andrew Fraser kicked off with an inspired rendition of the working tools of a master Mason, whilst Derek Haigh and Mark Curtis charged in with equally impressive explanations of the second and first degree working tools respectively. The trio was focused on excellence and nothing was going to distract them from their goal. They achieved it in glorious style. The working tools trio, pictured from left to right, are; Andrew Fraser, Derek Haigh and Mark Curtis. During the investiture of officers, Michael Tax and Ormerod Green set the scene for what was to follow with scintillating addresses to the senior and junior wardens respectively. There was a particularly poignant moment when Ormerod Green was appointed and invested as the new charity steward of the lodge. It followed the resignation of Gordon Thomson from the position after 16 years of loyal service. Ron Strangwick took a few minutes to pay tribute to Gordon for his phenomenal devotion to the office which he had tirelessly served with dedication over the years. Ron apprised the masses with a brief synopsis of Gordon’s achievements. 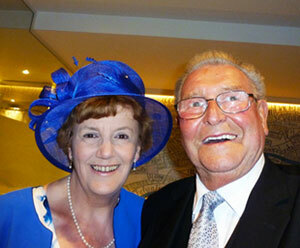 During his tenure, Gordon had raised almost £110,000 for the lodge’s charity account. In addition, he had served as charity steward for Peace and Unity Chapter No 3966, been the Blackpool Group Charity Steward and in the Province of East Lancashire similar offices in Blakewater Lodge of Installed masters No 9574, Lodge of Harmony and Industry No 381, Perseverance Chapter No 345, and Billinge Mark Lodge No 908. 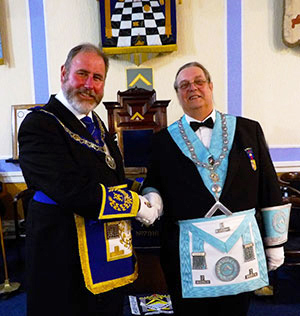 He was also festival representative for North Shore Lodge and the Blackpool Group during the 2010 Festival and for Blakewater Lodge, Lodge of Harmony and Industry and Perseverance Chapter during the 2004 and 2015 Festivals in East Lancashire. Outside of his lodge, chapter and group activities, Gordon and his wife June have organised and ran coffee mornings and garden parties at their home. It is probably impossible to determine the exact amount of money that Gordon and June have been responsible for raising over the years but a small indication can be found in an achievement certificate awarded to him after the 2010 Festival. The certificate recognised Gordon’s achievement of raising over £250,000 for the festival. In the summer of 2017, Gordon and June’s charity work was formally acknowledged when they received an invitation to a garden party at Buckingham Palace. Her Royal Highness Queen Elizabeth II wanted to thank them personally. Checking if the date was free in their busy schedule, Gordon and June made arrangements to travel to London to meet the Queen – it was the least they could do for Her Majesty! Gordon Thomson and his wife June at the Royal Garden Party. Ron’s delivery of the tribute to Gordon was sensitive, sincere and moving. In his audience, it caused goose-pimples to form on goose-pimples. Such was the admiration for Gordon’s service to his lodge. This was not the conclusion of the accolades bestowed on Gordon however. The newly-installed master Michael presented him with a celebratory plaque and bottle of rare whisky. A further surprise came when Ramon Ashton presented Gordon with a commemorative charity steward’s jewel in grateful thanks for the many years he had devoted to the lodge. The tribute became more moving at every stage and was clearly an emotional moment for Gordon. All that had been said proved that Gordon’s credentials made him the perfect candidate to invest Ormerod Green and advise him on his duties as the new charity steward, a task that Gordon executed with the same attention to detail in which he carried out his work during his 16 years tenure. Continuing with the investiture of officers, Tony Lea addressed the deacons with style and finesse and Campbell Cheyne gave a sincere and passionate address to the newly installed master. 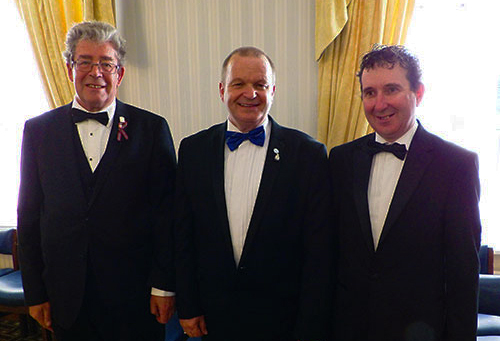 Maintaining a standard of excellence, Peter Wilson stepped forward to deliver a magnificent address to the wardens and Frank Umbers rounded off the proceedings with an exemplary rendition of the address to the brethren of the lodge. It was animated and sincere – just what the masses wanted. Frank Umbers (left) receiving a gift of appreciation from Michael Shakespeare. At the official announcement that the installation ceremony had concluded, Frank rose once more to convey greetings from the Provincial Grand Master Tony Harrison, focusing on the quality of the ritual and congratulating all involved in the ceremony. He paid particular attention to Ramon Ashton and the three ‘light blue’ brethren who had performed the working tools of each degree, making a point of shaking hands with each of them. Michael Shakespeare, cheerily in place in the chair, was clearly at ease with his preeminent office from the moment he had taken up his position. He was confident and outgoing and continued in similar vein at the festive banquet that followed. The ceremony of his installation had been a triumph and the masses were in high spirits as they donned their nosebags and got on the outside of a sumptuous celebratory meal. It went down as well as the ceremony had. An air of congeniality prevailed. Cheery banter was in abundance and the speeches reflected the happy mood. The master’s song, rendered with gusto and showmanship by Steve James, accompanied by Jim Coupe at the piano, perfectly complemented the theatre of the occasion and tyler Barry Hage provided a perfect finale before the curtain descended on the proceedings. Pictured from left to right, are: Graham Kenyon, John Riley, Peter Bentham, Ron Sands, Frank Umbers, Michael Shakespeare, Ramon Ashton, Harry Cox, David Thomas, John Turpin and John Pitches.